(9 May 2017) – Across Europe municipalities are teaming up with Transition Network and other citizen-led movements to help boost their efforts in creating sustainable change. In Brussels, Belgium, an upcoming gathering of citizen-led sustainability initiatives on 13 May 2017 will consider the relationship between public authorities and the region’s widespread and varied citizen-led movement. Supported by the Brussels minister for the environment, Céline Fremault, the gathering is being organised by a partnership of the region’s citizen groups and networks, and environment agency, Bruxelles Environnement. The city is home to a thriving citizen-led sustainability movement from community allotments and composting to initiatives on zero waste, food, mobility, energy conservation and local biodiversity. Participants at the Rencontre des initiatives citoyennes durables à Bruxelles will debate and discuss how local administrations and citizen-led groups can best collaborate in order to build local resilience for sustainability. What kind of models of governance are needed? What about human and financial resources? How do we collaborate in a way that surpasses sectoral divisions? What kind of people are getting involved in these citzens’ initiatives and how do we encourage more people to engage? Meanwhile a new international Municipalities in Transition Project aims to create a clear framework for how Transition groups and municipalities can create sustainable change together. 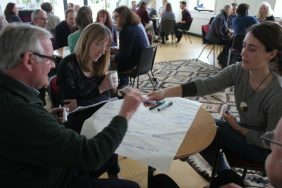 The project grew out of a recognition by members of the Transition Network, the international charity with links to 31 national Transition Hubs, that the valuable knowledge and experience of communities’ ground-breaking and potentially hugely impactful work with municipalities, is not being shared, built upon or disseminated. The project initiators knew of Transition initiatives in Italy, the UK, France and Spain where local groups had worked constructively and collaboratively with their local municipalites. The new project will test its framework in three (or more) pilot partnerships between Transition Hubs and municipalities. It will establish a developing evidence base; and a vibrant international community of practice which will support more municipalities, communities and decision-makers to engage with Transition-inspired approaches for sustainable change grounded in local needs.